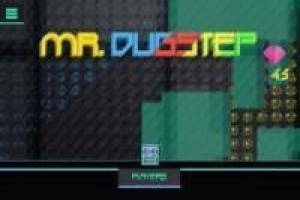 Mr. Dubstep is a game very similar to Geometry Dash and you will have to complete the levels of the game avoiding the obstacles. Not only will you have to be careful with the pinchos, also with some bad guys who will come after you as soon as they see you. You must dodge both enemies and obstacles if you want to overcome the challenge that Mr. Dubstep brings us. One of the things recommended by the game is playing with helmets and it has a very good background music while you face this challenge. When you go to the level selector, notice that in the upper part there is an additional one that is an endless mode, in which you must hold the maximum possible time in the route. Play Mr. Dubstep and show your skills with these games in the Geometry Dash style. Enjoy the game Mr. Dubstep, it's free, it's one of our Geometry Dash games we've selected.